It’s quite clear that Davies and Tennant wanted nothing but the best for Steven Moffat and Matt Smith. Both are clearly proud of their time on the show. Tennant apparently considered staying on when Moffat took over, while Davies has written for Smith’s Doctor and packs his scripts with affectionate shout-outs to the work of Steven Moffat. It’s impossible to argue that Davies and Tennant in anyway resented their successors, or wanted anything but for the show to continue to be a massive success. So the words “I don’t want to go” feel a little ill-judged. Certainly, neither Tennant nor Davies are being forced to leave. The BBC would have been quite happy for both to stick around for a few more years. Certainly, the willingness to slow down the production schedule to allow Tennant’s career to develop indicates that the company was interested in keeping him around. Similarly, Davies is well-liked and well-respected by the institution. He continued to produce The Sarah Jane Adventures and Torchwood after finishing up on Doctor Who, so he’s not being shown the door. But then, the other night, I saw a repeat of that Longford, that Channel 4 drama about the Moors Morders, and it did me no good at all. I sunk into a proper old gloom. I didn’t even tell you about it because it was foul. Peter Morgan is such a fine writer, damn him. His longford script is so fine and subtle, so deceptively simple, heartbreaking and true, and I was so powerfully jealous. I thought, I’m sitting here typing ‘INT. SPACESHIP’. What am I doing with my career? The answer is, having a wonderful time, with absolute freedom, I know, I know. All the same, looking at Longford, the real tick and bat and pulse that goes on between people, the sheer epic quality of ordinary life, even the lives of Lords and murderers, made me ache. I’m not knocking Doctor Who here, or my love of it. This show SHOULD be different. But I do wonder – to be sort of snotty about it, I suppose – whether I’m coarsening myself; when I go back to regular drama, it’ll be like starting from scratch. That’s why I turned down the opportunity to meet George Lucas the other day. The thought of more years typing ‘Int. Spaceship’ and playing with other people’s toys… I mean, no matter how much I love Doctor Who, it’s not mine. I didn’t create this show. Ah well. Lucas might not have liked me anyway. And I can always tell people that I turned him down. It’s a choice to leave, and it makes sense to leave when the duo are on top form. The fourth season of the revived Doctor Who was quite an accomplishment, with the show really grabbing hold of popular consciousness and becoming part of the national consciousness. However, there’s something very cloying about making the conscious decision to leave, and then announcing – quite candidly – that you don’t want to go. This isn’t an innocent bit of sledgehammering the fourth wall like Tennant and Moffat’s “you were my Doctor” in Time Crash. This is the last line uttered before the show changes into something else, something completely different. There’s no lead actor or executive producer to carry the show over. This is the first complete reinvention of Doctor Who in the twenty-first century, so it feels a little bit cynical and ill-judged to have the existing team bow out by implying that they’re really being forced out the door. It’s not a huge problem in its own right, but it’s a demonstration of how self-indulgent The End of Time, Part II is. It’s the climax of a show that is built around loving the Doctor, even when he doesn’t quite deserve to be loved – even when he’s at his most flawed and his most narrow-minded. It’s telling that Moffat felt the need to defuse that rather infamous last line in The Day of the Doctor. 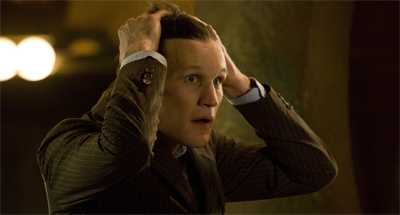 The Eleventh Doctor just laughs the melodrama of it all off. “He’s always saying that,” he assures Clara, as if talking about the drunk family member who won’t shut up about how much he loves the person unfortunate enough to wander inside of grabbing range. Moffat clearly doesn’t begrudge the remark, but he seems to find it just as bizarre as most of the audience. It’s excessively indulgent, quite like the extending closing sequence where the Doctor gets to visit all the people who affected his life one last time. To be fair, Davies is drawing quite heavily on precedent here. What is “the Tenth Doctor’s grand farewell tour” but an extension of the Doctor’s hallucinations at the end of The Caves of Androzani? There’s a precedent for this sort of nostalgia, and spinning bubbles weren’t going to cut it in 2010. With a time machine, it makes sense for the Doctor to actually visit as many of them as possible. So you can see the logic in Davies’ choice here. And, of course, he and Tennant have earned the right to be a little sentimental and a little indulgent. 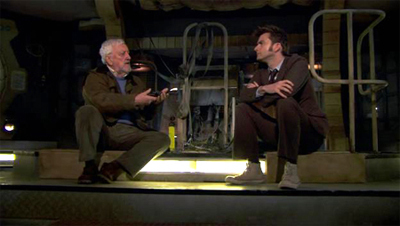 Davies oversaw the resurrection of the show, and turned it into one of the BBC’s most successful dramas by just about any objective measure. It’s getting high ratings; it’s well-liked by critics; it scores well on audience polls; it works well internationally; it’s a massive money-spinner both at home and abroad in terms of merchandising. For a show the BBC spent years trying to quietly smother in the eighties, that’s no small accomplishment. In theory, there’s nothing wrong with this approach, as heavy-handed as it might be. In practise, however, it feels a little trite. After all, Davies had his big bombastic farewell to his supporting ensemble in Journey’s End. It’s quite telling that all the major players on the Tenth Doctor’s goodbye tour, with the exception of Alonso and Verity, also got to play a big part in Journey’s End, an episode that aired at the end of the last season. Davies has already have a gigantic self-indulgent romp through his shared universe, and relatively recently. It might have been a year-and-a-half ago in real time, but it’s only five broadcast episodes. However, this gigantic victory tour feels also feels a little bit out of place because The End of Time, Part II is hardly the Tenth Doctor’s proudest moment. While Davies writes this version of the character with a health ambiguity, there’s often a sense of disconnect between the character Davies is writing and the character who appears on screen, as if Davies isn’t pithcing quite the tone that he seems to think that he is. It’s hard to tell where the Tenth Doctor’s sarcasm ends and his ego begins. He obviously cares about Wilf, so he’s not seriously considering leaving an old man to die because he’s not “important.” At the same time, you get a sense that the Tenth Doctor believes his own worth to be much greater than that of Wilf. Which, to be fair, is a claim that can be justified in any number of ways. Wilf probably hasn’t even saved the cosmos once, after all. This is not his happy face. However, what makes the Doctor the Doctor is the fact that he is willing to take these risks and make these sacrifices without pausing to consider whether the person he saves can be objectively said to be “worth it.” After all, that’s the whole point of the big run-around leading to this scene. The Master and Rassilon are willing to sacrifice countless lives in order to ensure their continued existence. The Master is willing to eat others in order to stay alive, and then imprints himself across the entire human race. Rassilon is willing to let the universe burn so that he may continue to exist. So the Doctor’s ranting makes him seem petulant. Terrance Dicks famously described the Doctor as “never cruel or cowardly”, and he seems to be both here. However, the problem isn’t that the Tenth Doctor is being cruel and cowardly. After all, there are a wealth of storytelling opportunities present by that characterisation, and there’s nothing wrong with a controversial or radical approach when it is done right. The problem is that this is happening right before we’re treated to an extended montage about how great the Tenth Doctor is and how much he deserves to be able to tour the universe and visit his old friends before he dies. It can’t help but feel a little tone deaf. 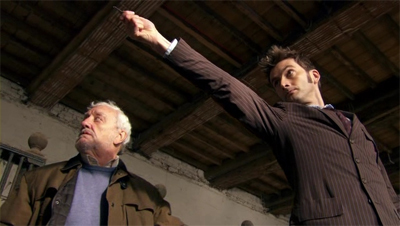 It’s really very hard to feel like the Tenth Doctor deserves his “reward” after ranting and raving about what a wonder he has been to the universe and how it doesn’t seem fair that he should have to save poor helpless Wilfred Mott. This tonal inconsistency is something the Davies era struggles with when it comes to the Tenth Doctor. A bit of ambiguity is great, but it often seems like Davies himself can’t decide whether the Tenth Doctor is somebody to be loved or feared. Here, for example, Davies actually calls the Doctor out on his selfishness – on his refusal to take the action necessary to stop the Master in order to save billions of lives. It’s a nice moment, because Davies consciously calls the Tenth Doctor out on his ego. In The Last of the Time Lords, the Doctor was perfectly willing to forgive the Master mass murder and to live alone with him forever in return for some company. He didn’t care about the damage the Master had done or the fact that human authorities might want to hold him to account. Even here, the Doctor seems more concerned with the Master than with the human race. “I don’t know what I’d be without that noise,” the Master admits. 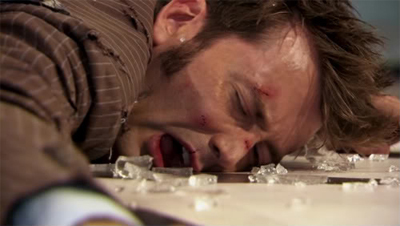 “I wonder what I’d be, without you,” the Doctor concedes. So it’s great that Wilf calls him out on it. However, the scene ends without any proper resolution. The Master’s evil scheme is ultimately undone without too much damage this time, and the Master is conveniently willing to sacrifice himself to defeat Rassilon. (Even though he was quite happy to play along until Rassilon told him that he could burn with the rest of the universe.) So Davies never follows through on that point. He never addresses the Doctor’s weaknesses. It feels like a cop out, as if Davies is unable to follow through on a consistent characterisation that he has noticed. Let’s talk about that “reward” a minute. 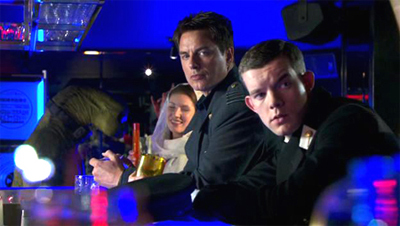 Davies tries to do a quick visit with his former companions and co-stars. That’s a nice idea, and a fitting end to the era, even if it feels a little indulgent coupled with the Tenth Doctor’s angst. However, the end result is less than satisfying. Davies marries off two of the show’s three female companions. Neither marriage represents the pay-off to a long-term story arc. Donna marries a guy we met in the last episode; Martha marries a loose-end, with no mention of the character she had been engaged to in The Sontaran Stratagem. The only screentime Mickey and Martha shared was at the end of Journey’s End, when Mickey ran after Jack and Martha. The scene is opening to all sorts of unfortunate implications (the only two person-of-colour companions to date wind up happily married to each other), but it’s very clearly an example of Davies simply pairing off two spare characters. This is one of those decisions that can be fairly easily justified, but looks quite unfortunate in the larger context of the show. Martha and Mickey are really characters who ultimately feel like left-overs from Rose’s arc on the show, so it’s thematically appropriate (if unsatisfying) that they end up together. That said, you could interpret the scene as suggesting that Mickey officiated at the wedding between Martha and Tom, but it would seem a bit weird that the episode credits her as “Martha Smith-Jones.” Maybe it’s a gag on the fact that Martha’s first episode was Smith & Jones. It’s also interesting that The End of Time suggests that Martha has finally cut herself free of U.N.I.T. and is now working freelance. It’s a strange character choice, given how The Sontaran Stratagem spent so much time trying to redeem U.N.I.T. as an organisation – trying to make them better. Then again, Journey’s End seemed to suggest that she wasn’t quite succeeding. In a way, it’s a demonstration of the difficulties that the Davies era seems to have with U.N.I.T. as a concept. It’s understandable. The Jon Pertwee era, which the Doctor spent as an employee of a multi-national military taskforce, remains one of the most divisive in the show’s history. There is a lingering discomfort about making the Doctor an establishment figure. Davies seems quite happy with the idea of the Doctor as a strongly independent and anti-authority hero. So you can see why Davies would have some trouble with the organisation’s place in the history of Doctor Who. At the same time, they are an essential part of its legacy, and one that is quite iconic. While the general public remembers so little of the Sylvester McCoy era that they can be surprised at the political content of The Happiness Patrol, everybody remembers Jon Pertwee. The Brigadier may not have appeared on the revived show, but he is referenced repeatedly. Steven Moffat has created (or revived) a recurring character intended to be his daughter. So that uncertainty plays it out across the Davies era, balancing the iconography and popular appeal of the Pertwee era with it’s more problematic elements. In Fragments, U.N.I.T. are revealed to have held Tosh without trial, in an obvious shot at the sort of practises conducted by British and American armed forces as part of the War on Terror. While episodes like The Aliens of London and The Christmas Invasion made them look quite ineffective and trigger-happy, the show seems to have been making a conscious effort to redeem them since The Poison Sky. Indeed, since the fourth season, it seems like Davies was trying to redeem U.N.I.T. somewhat. In The Poison Sky, they are invaluable to the Doctor’s plans and prove quite clever in their own right. U.N.I.T. were pretty useful to the Doctor in Planet of the Dead, to the point where they were the first number he called when trapped on a planet half-way across the universe. They were also essential to saving the planet in Turn Left. That said, they do seem to be complicit in the ghetto-isation of Britain and the setting up of “labour camps”, so even then Davies doesn’t seem too fond of them. Still, having Martha leave U.N.I.T. to work in the “private sector” feels like a bit of a strange place to end her story. We’ll assume she’s gone on to become her own hero in the style of Sarah Jane Smith, rather than forming a private defence contractor firm run by former companions. That said, that would be a rather brilliant character hook. Imagine a consultant you could hire with practical experience of dealing with the unknown or the strange or the surreal. It would just be at odds with the entire ethos of the Davies era. But more than the problems raised by Martha’s farewell, there’s the fact that Davies decides to close off the character arcs of his two remaining female companions by marrying them off. This is a recurring trend during the Davies era. Martha ended the third season by striking up a meaningful romance that worked as a substitute for her one-sided relationship with the Doctor. 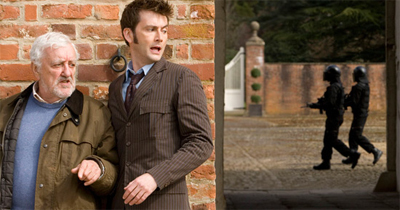 The Doctor sent Rose to an alternate world with a clone of him so the two could live happily ever after. Here, Martha and Donna both get married; it doesn’t matter to whom. Contrast the departure scenes for Martha and Donna with the scene featuring Jack. Jack remains a free man, a bachelor. The Doctor introduces him to Alonzo from Voyage of the Damned. However, the scene is played more like the Doctor setting up Jack for a one-night stand, complete with cheesy come-on lines and notes scribbled on napkins. So while Martha and Donna also hook up with people we’ve only recently seen them interact with, the commitment feels much more serious. It’s worth noting that the cantina scene is clearly and consciously designed to evoke the similar sequence in Star Wars. It’s an excuse to feature all the alien designs from the previous half-decade of the show. In a way, it seems rather like what Davies had intended to do with the Shadow Proclamation scene in The Stolen Earth, an excuse to raid the monster costumes from the back of the storage cupboard. We get an exciting airborne action sequence that seems intended to remind viewers of the iconic TIE fighter sequence from Star Wars, where Luke takes to the Millennium Falcon’s gunner seat to help defend the ship. While there are no light sabre battles, the Master turns against Rasillon by firing bolts of electricity from his hands in a manner that recalls the climax of The Return of the Jedi. There’s hints of a secret concerning our hero’s parentage. 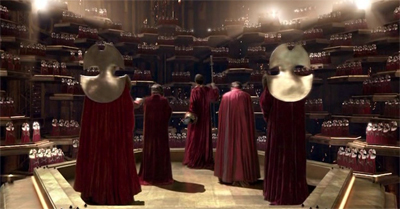 Even the Council of the Time Lords seems designed to invite comparisons to the Imperial Parliament from The Phantom Menace. Once again, there’s a sense of indulgence in all this. Davies is demonstrating that his version of Doctor Who has reached a point where it can go toe-to-toe with Star Wars – a point where it is epic science fantasy on a scale that was never before possible on the budget that the BBC afforded the show. There’s a clear sense that Doctor Who is basking in its own success, arguing that it could easily compete with one of the biggest science-fiction franchises in the world… if it wanted to. Then again, there’s a sense that Davies knows that the show shouldn’t really be subsumed by spectacle and bombast. While The End of Time takes us to the last days of the Time War, it consciously avoids showing us any of the large-scale conflict, settling for a bunch of people in a room talking in a city surrounded by the remains of crashed and crushed Dalek saucers. It’s an image that is more suggestive than anything else. But this is fantastic, isn’t it? The Time Lords restored. You weren’t there in the final days of the War. You never saw what was born. But if the Timelock’s broken, then everything’s coming through. Not just the Daleks, but the Skaro Degradations, the Horde of Travesties, the Nightmare Child, the Could-have-been King with his army of Meanwhiles and Never-weres. The War turned into hell. And that’s what you’ve opened, right above the Earth. Hell is descending. It’s beautifully evocative prose, conjuring all manner of fantastical imagery in the mind of the viewer. There’s no visual that could really match that, and Davies knows better than to try. Instead, there’s a sense of the entire universe burning and writhing as various Lovecraftian monsters are loosed into the fray. The man who would never… except when he does. That said, it’s fun to try to fit the climax of The Day of the Doctor with The End of Time. Moffat dismisses Rassilon’s plan here with nothing more than a line, suggesting that the events play out simultaneously. It does mean that the Tenth Doctor goes right from saving Gallifrey to destroying it once again, casting it back into the pit and the darkness. (The revived series tends to equate hell with the void and with nothingness, and arguably with the show’s own cancellation.) And it does raise questions about whether Rasillon and the Master will be waiting on Gallifrey when the Doctor eventually shows up. Whereas The Day of the Doctor presented the inhabitants of Gallifrey, and even the Time Lords themselves, as victims in this conflict, The End of Time repeatedly (and heavily) compares the Time Lords to the Daleks. The “visionary” advising the Time Lord High Council can’t help but remind viewers of the insane and rambling Dalek Caan from The Stolen Earth. As Rassilon faces his own mortality, he vows, “I will not die!” The Dalek Emperor made the same boast in The Parting of the Ways. Moffat ultimately doesn’t follow up on this thread, but Davies throws it out there. Like the identity of the woman with Rassilon, Davies seems to enjoy opening as many possibilities as possible, rather than firmly tying the show down before he leaves. 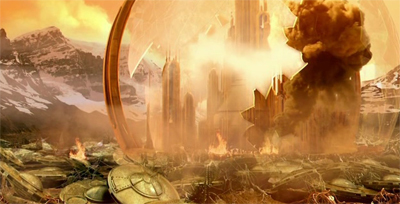 After all, The End of Time teases the return of the Time Lords, with Davies considering putting everything back where he found it. Instead, he resists the urge to so fundamentally affect the nature of the show just before leaving, giving Moffat a lot of freedom to tell his own story. Still, The End of Time remains rather unsatisfying on its own terms. Loose ends like that are one thing, with Davies refusing to commit his successor to a new direction or radically up-ended status quo. The episode itself feels like it never really explores the potential of any of its plot threads as it rushes through ideas. There’s a sense that Davies is really trying to check off a list of items from a checklist. For example, the plot involving six billion Masters offers a range of possibilities – how could the Master trust himselves? would his clones really blindly follow orders? how would they decide who led? after all, if they are all versions of the Master, surely they all share his desire to dominate and rule? And it’s all undone with a wave of Timothy Dalton’s glove once it has served its particular plot function. Naismith gets even less space in the story. We’re only informed of his fate by way of awkward exposition from Wilf. It was Bad Wilf all along! Similarly, the return of Gallifrey is barely touched upon. It threatens to envelope the world at the episode’s climax, but it’s over almost as quickly as it began. There’s no real exploration of the innocent people who must be stranded on Gallifrey in the midst of all this. All we see of the planet is an establishing shot of the Citadel, a CGI-ed senate chamber and a bunch of people in robes talking to one another in a room. There’s no context or scale to all of this. That said, there are some good moments in The End of Time. 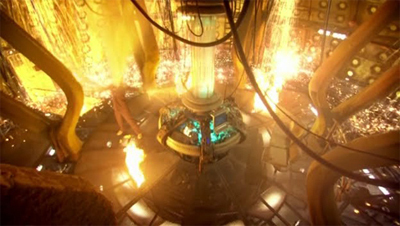 The final scene of the Doctor alone in the TARDIS is heart-breaking, even given all the melodrama leading up to it. David Tennant really conveys a sense of desperation and fear in the Tenth Doctor’s last moments, making it clear that this is very clearly a form of death. “I don’t want to go” might be a bit much, but the Tenth Doctor’s stubborn clinging on to life makes the regeneration instantly memorable. Similarly, Davies’ version of the Master remains compelling, even if the stories featuring him don’t deliver on the full potential of the character. John Simm is brilliant as ever, and I particularly like his acting for six billion people. In particular, there’s a nice moment where Naismith!Master seems quite frustrated at getting an order from the original Master. The idea of turning the Master into a victim of Rassilon and the Time Lords is a little contrived, but it does provide a convenient excuse for his insanity, and a solid motivation. 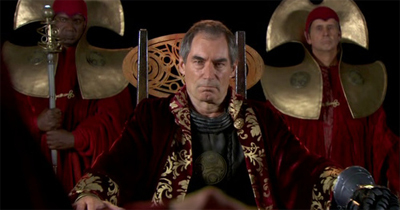 It’s also interesting to see Rassilon. Again, this is a rather niche character. He’s not even ranked with Davros in terms of “characters fans desperately wanted to see making a return” and he doesn’t have the pop culture cache of any of Davies’ other “big bad” characters like the Daleks or the Cybermen or the Master. 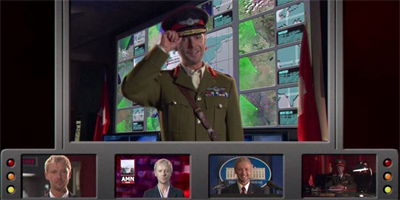 Rather, he just seems to be included because Davies could – to the point where the only acknowledgement of the character’s identity is a line from the Doctor, rather than the credits of the episode, which identify him merely as the President. Still, The End of Time feels like a bit of an anti-climactic end of an era for Davies and Tennant. It’s loud and bombastic, but it doesn’t embody the strengths of this period of the show. It winds up feeling strangely empty. One thing I’ve picked up from your reviews is The Writer’s Tale sounds like an interesting read. I’ll have to add it to my (long) list of books to chase up. I completely disagree regarding the Doctor’s reward – the last 20 minutes or so rivals the last 20 minutes of The Family Of Blood as some of the most emotionally beautiful television this century. I cannot think of a better end line than I don’t want to go – perfect and I think most viewers know exactly where Tennant & Davies are coming from. You don’t seem to mention the music: has there been any better or more powerful since? I have acted out the final exchange between 10 & Wilfred and channelled my frustrations in that scene. That is where he takes us. Sure, the episode isn’t perfect but it is a perfect emotional send off for one of the best eras of modern day television. Something that may never be matched in my opinion. That’s a fair point, but I still maintain that a lot of what Davies did in the final twenty minutes of The End of Time had already been done at the end of Journey’s End. The specials were largely a victory lap for the Davies era, which I think makes their indulgence seem a little frustrating in places; a victory lap is an indulgence of itself. I thought your response would be on screen but it isn’t so forgive any incorrect references. The other ending where they are all in the TARDIS was, I think, a gathering together for the fans. I didn’t feel anything about it. For me, the End Of Time finale is all about the Doctor and his reward – interestingly, often making the world of his friends a better place (man’s common end according to Dickens in Dombey And Son). I can see how it may be seen as an indulgence by some – but surely even the hardest nosed fan would concede after what Davies & Tennant did to regenerate Doctor Who, they deserve a little indulgence? Give them a little leeway, a little poetic licence. As you can detect, for me it isn’t just an indulgence but, honestly, the only reason I watch The End Of Time Part II over and over again (okay, the 2 scenes with Wilfred in the cafe & spaceship are beautiful). I cry buckets during the last 20 minutes or so and I have to ask, how many times have I shed a tear since then watching Doctor Who? The scenes in The Rebel Flesh with Mark Bonnar’s son did bring a lump to my throat (I think because I had a 3 year old son at the time plus a new born son also). Then I have leap forward to The Girl Who Died – why did I cry? Guess who turned up? Doctor 10 & Donna! Reminding me just what we have been missing for 5 years – the emotional resonance, the tugging of the heart – strings and RTD & DT. So yes, I am more than prepared to make allowances for any indulgence the pair wish to have – they earned it and more than deserved it. Doctor Who wouldn’t be where it is today without them. However, I think I’d be a lot more enamored with the end of The End of Time if Davies hadn’t covered a lot of the same ground only four stories earlier. Fair enough. I just don’t think the two episodes are that similar, emotionally. However, I am refreshed to hear someone else who rates Eccleston ‘s contribution. I agree: without his genuine gravitas and him obviously taking it 100% seriously, I don’t know if the new series would have been so successful. The fact that he took it so seriously made everybody sit up and take notice. I am still greatly saddened that he felt he had to leave when he did but I am still immensely appreciative of what he did and yes, I cried my eyes out throughout his regeneration scene – absolutely beautiful. Just reading your review after re-watching the End of Time, and I have to say – it is the absolute proof that a Doctor Who movie would be a crappy idea. That said, the BBC’s production company would be great for a proper sic-fi movie; with the budget they had on this, they could make a blockbuster at half the price the Americans spend! In all seriousness, though, this was a necessary episode. 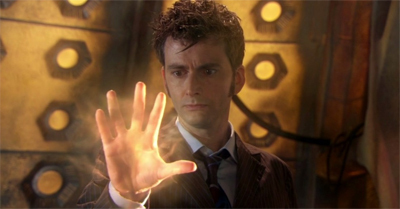 The Tenth Doctor was (and is) so beloved, that he needed a properly sentimental sendoff. That being said, in hindsight, I will never understand the loads of people who actually think “I don’t want to go” is a good line, much less a tragic one or one that really creates feelings other than “oh, for God’s sake!”. Sidenote: Tennant ad-libbed that one. Blimey. Yep. I mean, it is a blaoted mess of an episode. But the Tenth Doctor and the Davies era had earned something of a blank checque when it came time to cash in.